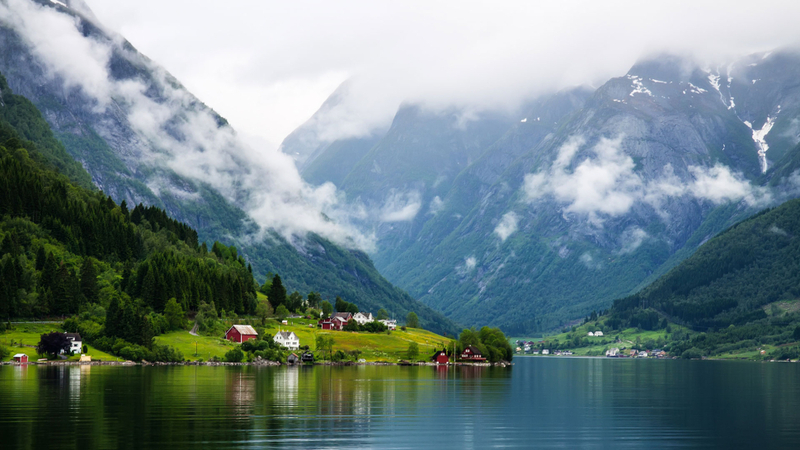 Norway is one of those countries that many of us dream of visiting; it’s cities are modern and easy to get around, but the real reason many of us are drawn to Norway is the ample natural beauty that you’ll find here. From stunning fjords to the Northern Lights, no matter what kind of nature you love the most, you’ll almost be certain to find it in Norway. If you’re going to see any Fjord in Norway – or perhaps even in the entire world, this is the best one to visit. It is absolutely beautiful, the contrast between the water and the greenery around is just absolutely striking. This Fjord is part of the UNESCO World Heritage program and when you find yourself admiring it’s beauty, you’ll understand why. Escape the business of normal city life and find yourself at peace here in the Geiranger Fjord. You may want to pack an extra battery for your camera, because chances are you’ll be snapping away. The best way to view the Fjord is by boat, there are many inexpensive options making it a great choice for your next holiday to Norway. I personally adore seeing at least one cultural performance in each place I visit, and where better than to visit the Norweigian National Opera and Ballet in Oslo. It’s a good idea to check well in advace of your trip, as often tickets will sell out days or weeks in advance of the showing. There’s nothing worse than showing up to a city without activities planned, only to find a show or performance you would have loved to have seen, has sold out. It’s even more challenging when you only have a few days in a city, so the chances of finding a ticket in time is very low. This is something you’ll be glad you made the time to book in advance! As a bonus the building in which the theatre is housed is a modern architectual wonder, so worth a visit on it’s own accord, but in my opinion it’s much better if you can factor in at least one performance during your visit to Norway. You can easily take a train from Oslo to Bergen, which is a beautiful town and a photographer’s dream. Here you’ll find colourful wooden houses that line the old wharf, which was formally an integral part of the Hanseatic League’s trading empire. While there’s a lot to do and see in Bergen itself, many people find themselves visiting Bergen as the gateway to many of Norway’s most famous Fjords, but it would be foolish not to dedicate at least a few days to this beautiful city, which is a European City of Culture, a name bestowed on Bergen due to the rich history and beautiful historic buildings scattered across the city. Within the centre of Bergen you’ll be spoiled with choice, whether you’re wanting to see exhibitions, performances, or festivals, you’ll find an extensive range in this wonderful city. It’s also emerging as quite a culinary hot spot, and during the year of 2016 Bergen earned the UNESCO title City of Gastronomy. This is maybe one of the most instagrammable places in all of Norway. Some 640m above sea level is this amazing, oddly shaped cliff edge which seems to have been perfectly crafted with Base Jumpers in mind. So if you’re looking to try a new, extreme sport in Norway, this could be the spot for you. The odd thing about the cliff is that it is almost a perfect square: the measurements are around 25meters by 25meters, making it a great launching pad for base jumpers. During ancient times, this cliff could have been used for ceremonies and rituals, but now days it’s mostly adored by tourists hoping to get a great thrill and photo. Just be warned it’s a popular destination, with around 300,000 people visiting each year. As such it’s a good idea to plan your visit for earlier in the day if you’re looking to have a more private photo here! Only discovered in 2007, this large and stunning ice cave is located below the Nigardsbreen region of one of Norway’s national parks named Jostedal Glacier National Park. It’s been described as an ice cathedral, because the cave inside is large and impressive, with large icicles falling from the ceiling. This is a stunning representation of the effects of global warming on our world; the cave is thought to be a by product of glacial melting due to climate change. You have to visit the cave with a guide, which is especially important during the warmer months when the temperatures are hotter and the cave is experiencing active melting, which means that it could potentially collapse. Don’t let this put you off visiting, just make sure you visit with an experienced guide.